Pro Android 2 shows how to build real-world and fun mobile applications using Google's latest Android software development kit. This new edition is updated for Android 2, covering everything from the fundamentals of building applications for embedded devices to advanced concepts such as custom 3D components, OpenGL, and touchscreens including gestures. While other Android development guides simply discuss topics, Pro Android 2 offers the combination of expert insight and real sample applications that work. Discover the design and architecture of the Android SDK through practical examples, and how to build mobile applications using the Android SDK. Explore and use the Android APIs, including those for media and Wi-Fi. Learn about Android 2's integrated local and web search, handwriting gesture UI, Google Translate, and text-to-speech features. 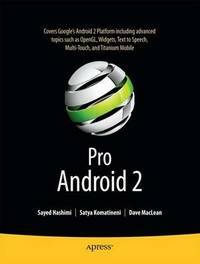 Pro Android 2 dives deep, providing you with all the knowledge and techniques you need to build mobile applications ranging from games to Google apps, including add-ons to Google Docs. You'll be able to extend and run the new Google Chrome APIs on the G1, the G2, and other next-generation Google phones and Android-enabled devices. Sayed Y. Hashimi is the author of Pro Android, as well as a consultant and trainer in Jacksonville, Florida. Sayed has worked for startups and Fortune 100 companies. He has developed large-scale distributed applications with a variety of programming languages and platforms, including C++, Java, and .NET. Sayed has published in major software journals on topics ranging from low-level programming techniques to high-level architecture concepts.